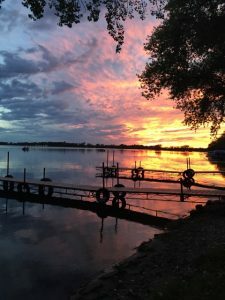 Clean Minnesota cabins that are furnished with full kitchens, bedding, heat, showers, fans, AC, hide-a-bed, microwaves, color TV’s, gas BBQ grills and a 16 ft. Lund boat. The resort is on level ground and is sheltered 3 directions from the wind. We have a fish cleaning house and freezer, live bait, tackle, fishing licenses, dock side gas pump and oil, picnic tables and chairs on decks, unattended swimming beach, chaise lounges, play yard (sand box area), camp fire ring and wood, sand volleyball court, horse shoe pit and dock fishing. 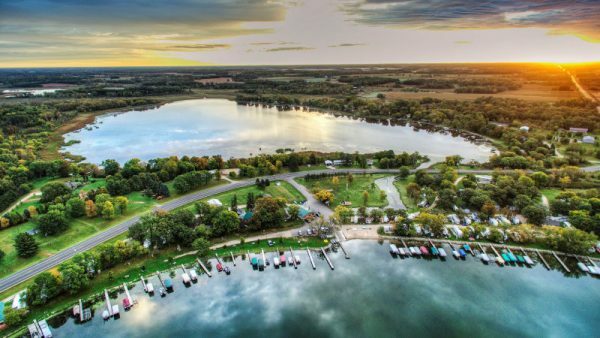 We are the home of the “Famous Fishing Dock”, where trophy walleye, northern, and panfish have been caught. 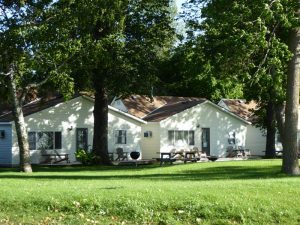 Our peaceful resort is located on a quiet, loop road, on the highly-desireable, protected north side of the lake. We have 19 beautifully-decorated, spacious one, two, three and five-bedroom cabins, with AC, fully-equipped kitchens, satellite TV, grills, comfortable mattresses, and patios or decks. Holiday Resort has level grounds, a private boat launch, dock space for your boat, four fishing pontoons to rent, complimentary 16′ Lund fishing boats, motor rental, fish-cleaning house, live bait, gasoline and oil, fishing licenses, paddle board, surrey bike (everyone’s favorite! ), a sandy beach, swimming area, lounge chairs, volleyball court, laundry facilities, a lodge with small essentials, ice cream, beverages, pool table, apparel, and an awesome staff! Please check our website for a pictorial tour of Holiday Resort, where wonderful memories are made. And remember, in addition to summer, we have excellent spring and fall fishing! NW shore of Lake Osakis. Our resort is well known for excellent Dock Fishing with 19 comfortable benches on a steep drop-off for walleye, northern and panfish. Eleven 1-2-3 bedroom clean cabins (all electric) with air conditioning, color TV, microwave, deck, grill, lawn chairs and picnic table. We are located at the end of a dead end road on level grounds. Docks protected from 3 directions of wind. Lodge with snack bar, groceries, fishing licenses, tackle, bait, dockside gas, pontoon, 16′ boats, bass seats, motors, guide, boat ramp. Our beach has a shallow gentle slope with no drop-offs, lounge chairs, playground, gameroom and much more. 23+ years on Lake Osakis. A small resort, big on hospitality. Quiet country setting. 8 modern lakeside HSK cabins, boat included. Rec-room with pool table, games, TV, VCR, and lots of movies. Snack counter, staple groceries, bait, tackle, gas, and motors. Playground, funbugs, and paddleboat. Swim area with no drop-offs. Enjoy panoramic sunsets over the lake. The Family Resort for the Serious Fisherman! Quiet setting-close to town. Clean, modern 1-4 BR cabins with decks and grills, kitchenettes, hotel rooms and camping, boats available with housekeeping units, color cable + HBO, indoor pool and sauna. Near antiques, museums, bike/snowmobile trails, and golf. Full dock service, store, game room, volleyball, large wooden playground, pontoons. We can accommodate large groups and short stays, “Fish and Golf” packages. Great spring and summer dock fishing!